Went through Cuan from Craobh to Kerrera this afternoon, 9 August. Left Craobh at HW Dover minus 30 minutes, motored and reached Cuan at maybe HW Dover plus 30 minutes. Only had about 2 knots of tide with us through Cuan, so that was OK , but it was very bumpy when we exited. So, was it so lumpy because? Residue from the F9 storms on 6th to 7th? Wind from West so wind over tide? Too early so still a tidal flow south through Sound of Inch? We were in company with a Westerly Duo 29, but don't think anyone has any pictures. Too busy hanging on!!! You could try going through at 'slack' (SIC) water, usually about 1-1.5hrs before HW/LW Oban. First time we went through I thought it was 'orrible, but now it's a walk in the park. Life wasn't a bowl of lost cherries for us the first time - I didn't 'do ' tidal flow in those days, just a look at the map and "we'll go through here". We had a shipman 28 with the original farymann hydraulic setup which couldn't pull the skin off custard. We spent about 40 mins looking at the pylon while other boats whizzed past. Since then we have a better insight! Nice part of the World, enjoy. We're still in the Clyde waiting for Summer. We went through last year to show my son how interesting it was. What a letdown, went through at neaps just as the tide went with us, boring. After a night in Puiladobhrain I thought, show him Pladda, same thing, nothing. Came through Cuan a couple of weeks ago at half flood, wow, swirly bits, knots, bow wave on Cleit rock, more swirly bits, more interest than you can shake a stick at. It was the waves at the exit. When you looked out, every wave was white topped. The Vega went over some, but through most. The burst of spray reached back to the sprayhood. The speed through the water fell from 5 knts to 3.5 with the 13.5 hp Beta. I think that it was the wind against tide. I suppose that it would have been been worse if we had been later and the tide was running harder. With hindsight, it might have been smoother if we had gone in against the last of the east going flow. 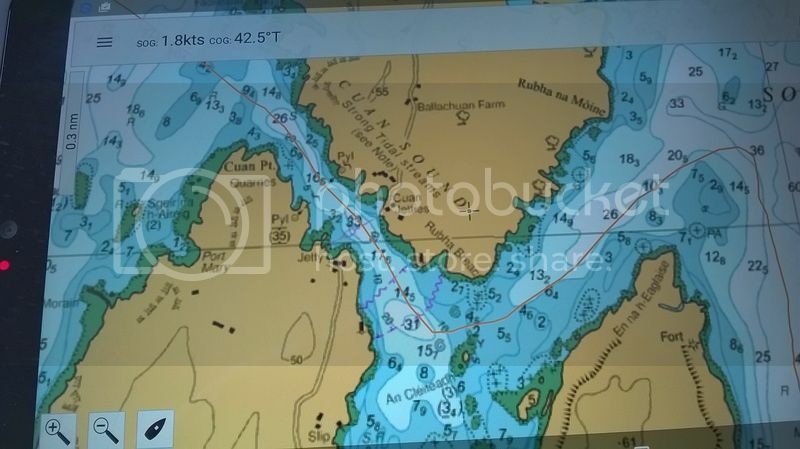 Yesterday, Wednesday, 10th, we motored into head winds from Kerrera to Loch Aline, mainly with a slight adverse tide and the waves were smooth topped. There was a short spell when the tide was with us, and the waves were then white topped and breaking. Sitting on the pontoon at Loch Aline today and you can only just see the red buoy nearest the entrance through the mist and rain. Phoned Tobermory, and there is only 1 pontoon space so think we're stuck here till Saturday. Maybe need to use the bus pass!! Wonder if it helps on the Fishnish ferry? In our experience, there is always a race of breakers on the flood at the west end of Cuan sound. Even in fairly calm conditions. You certainly get wind-over-tide in a westerly, but even the tide seems to set up waves for about 1/4 mile. You are getting a really sh1te spell of weather even for the west coast up there this year. It is not much better on the Clyde. We have been out only a couple of times on our new boat and have had the full set of sails up only once. We were hoping to get out on Wednesday as the original forecast was for light winds and dry weather. Some hope! Now we are hoping to set off on Sunday if the promised weather arrives. Catherine and I went through at full flood against a strongish Westerly at the start of our holiday last month. Fairwinds was standing on end ! It was the worst overfalls there I have experienced in 13 years, speed going from seven knots to one knot, everything everywhere, and it went on nearly half way to Easdale. Would that be Fairwinds or Catherine ?? Well, Cuan Sound spat us safely back into Seil Sound this morning. Came through at HW Oban +3, springs. GPS reckons that we hit 11.8 knts when motoring at 5. We are sailing in company, and the other boat led through. We met the ferry which was coming uptide on the Luing side. I was feeling quite brave and gung-ho till I spotted a Drascombe which left Seil and followed us through. Cuan was a change in plan. We had left Dunstaffnage at HW Oban with the intention of motoring to Crinan Basin via Sound of Luing and Dorus Mor. We left Kerrera to port, and Bach Island and Insh Island to starboard, but didn't get much lift in the big open bit of water south of Kerrera, and thought that we might miss the tidal gate at Dorus Mor. We're now berthed in Craobh, and will hit the canal tomorrow, Monday. Rhuba Breac - that was the little tinker. Doing 5 knts with about 3kts of current. Took the long way round En na h-Eaglaise I see. Aja wrote: Took the long way round En na h-Eaglaise I see. Yes, did that both ways. Think that I could be persuaded to stay close into Torsa when West bound, but boat was still squirming about as we came past the point east bound. I don't think that I would be confident of holding the required course. The Drascombe went tight inside the rocks. Last edited by ash on Sun Aug 21, 2016 11:34 pm, edited 1 time in total. claymore wrote: Rhuba Breac - that was the little tinker. Doing 5 knts with about 3kts of current. How far on to the rock were you? I realise that the story has been told at céilidh throughout the western isles for generations, but does the written word exist in the ethernet? PS I believe that HRH sits in the cockpit of the Rustler and tells her friends about the day that she met , in the chandlery at Ardfern, the man who mounted the rock in Cuan.